Bringing home your new bundle of joy is exciting to say the least, but where should the baby sleep? The crib may be an obvious choice for many parents. However, some like to keep their baby even closer. Co-sleeping is quite a controversial subject. Some advise against it, but by taking the right precautions, your baby can sleep safe and sound next to mommy. In fact, many people actually think it’s better for the baby. When choosing to co-sleep, it’s best to use a co-sleeper. But with such a huge choice available, which should you pick? Don’t worry, we’ll help you sort through some of the best. Use the links above to check the latest prices or read our in-depth co-sleeper reviews below. The choice between crib or co-sleeping is a tough one for many new parents. But what is co-sleeping? Many people automatically think that co-sleeping means the baby is sleeping in the adult bed next to mom and dad. But, there’s more to the term. You may have heard terms like “room-sharing” and “bed-sharing,” these are actually all considered to be co-sleeping. Room sharing: Your baby is not sleeping in your bed, but there’s a crib, bassinet, or bedside sleeper in the same room as you. Bed sharing: Your baby is sleeping next to mom or dad. Bed-sharing is not recommended as it comes with many risks, such as SIDS and suffocation (source). If you do choose to co-sleep, in order to make the situation safer, you will need a co-sleeper. There are different types, depending on where you want your baby to sleep. 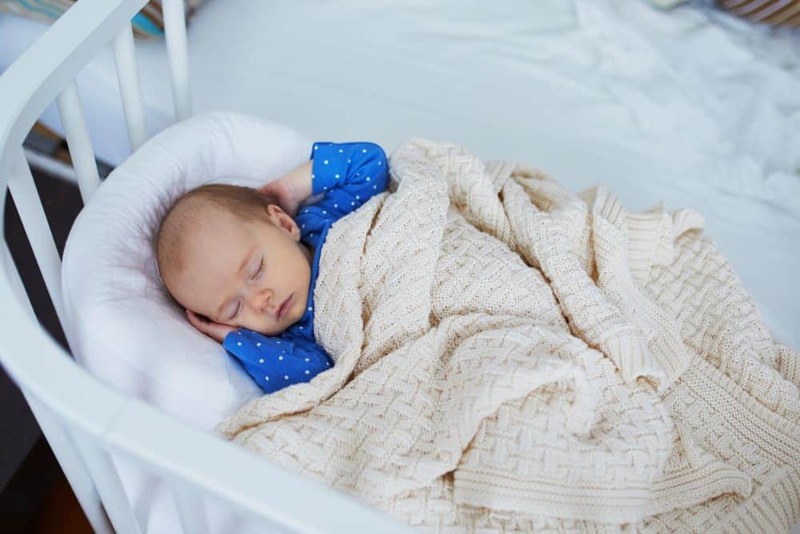 For example, if you would like them to sleep in your bed, there are nests and small bassinets available that give your baby their own safe space to sleep while in the bed. If you want to co-sleep but would rather not share the bed, opt for a bedside sleeper. 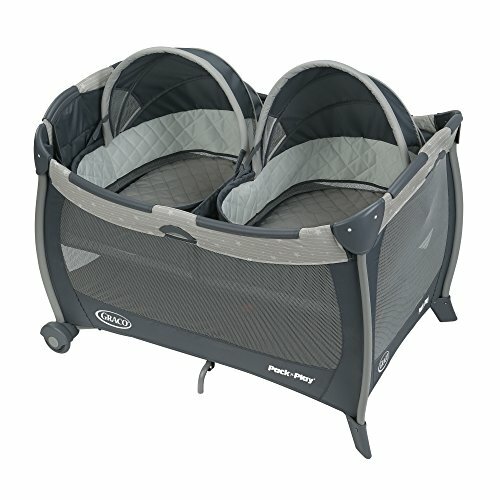 These can look like regular cribs, but you adjust them to fit the height of your bed. These cribs can be right against the side of your bed. You can even attach some bedside sleepers to the bed itself. And because of the open side, you can also breastfeed without getting out of bed. Choosing the perfect co-sleeper is difficult. There are quite a few things to consider and features to look for. You might want your baby to stay as close as possible so you’re aware of their every move. But the co-sleeper also has to be a safe environment for your baby to sleep in. Let’s go through the essentials. Your baby may be tiny as a newborn, but they certainly won’t stay that way for long. Therefore, it’s important to consider the fact that the co-sleeper has to accommodate your growing baby. When buying a bedside sleeper or co-sleeping crib, you can get one that also functions as a regular crib. Then you won’t have to get a separate one for naps. These cribs allow one side to be lowered, after which you can attach it securely to the side of the bed. As your child grows and you want to stop co-sleeping, you can still use that same crib. You’ll also avoid having several pieces of furniture in your bedroom. Keep in mind that this will be a place where your baby will spend a lot of time. 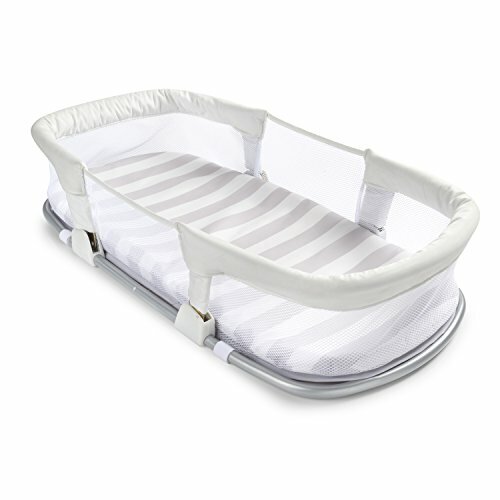 The crib, cot or bassinet has to be comfortable to keep your little one nice and snug. 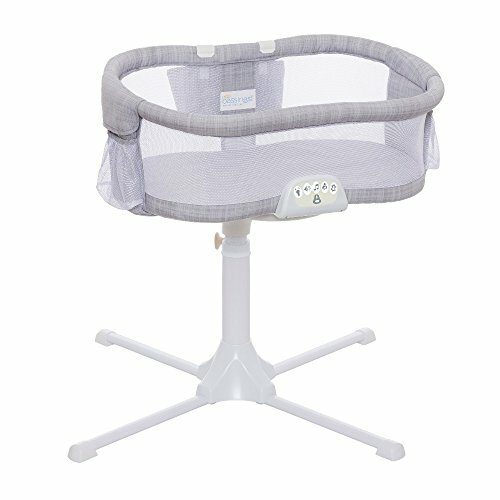 You want your baby to sleep in a good environment, with a mesh net instead of solid sides for good airflow. The mesh net will also make it easier for you to see your baby without having to get up. It’s important that the mattress or surface your baby sleeps on is firm. According to the American Academy of Pediatrics, all cribs, bassinets, and cots have to meet certain requirements. One of the more important requirements is that the mattress needs to be thin and firm. A firm mattress might not look or feel as comfy as a plush blanket, but it will prevent any accidents (source). If your baby is sleeping on a soft mattress, there’s the risk of the baby sinking into the bed. For us as adults or older children, it might be comfortable and we can move into a different position. For young babies, however, this can be highly dangerous. Your baby might look sweet and innocent now, but just wait till those diaper explosions come along. Your baby is bound to at least experience some reflux or spit-up. The co-sleeper is inevitably going to get dirty. Opt for one with a removable cover, so you can easily take it off to clean when needed. Being close to your baby is the reason why so many parents choose to co-sleep. But remember, letting your baby sleep in a bassinet or crib next to your bed might be a better option (source). No loose blankets, pillows, toys, etc — the sleep space should be bare. Avoid overdressing, so baby won’t overheat. Bedding should be tight fitting. Always place your baby on his or her back (source). By now, you’ll have a better idea of what to look for when shopping for a co-sleeper. Keep in mind that safety should always come first; therefore, it’s important to check the mattress. You should also make sure there aren’t any openings or gaps where your baby could get stuck. As parents, we always want the best for our children. Babies have sensitive skin, so it’s crucial that we offer them soft clothes and bedding. Using only natural and organic products can help keep your little one growing happy and healthy. Those sleepless newborn nights as a breastfeeding mother were tough. It can be super frustrating to nurse your baby only to have them crying the second you put them down. The Snuggle Me co-sleeper and lounger has been designed to create a cozy place for your baby. As you put your baby down for the night, the sides of the sleeper will gently hug your child. This gives your baby a secure feeling, as if you were still holding them. This is good for babies up to nine months of age. The snug fit helps to prevent your baby from accidentally rolling over when sleeping. 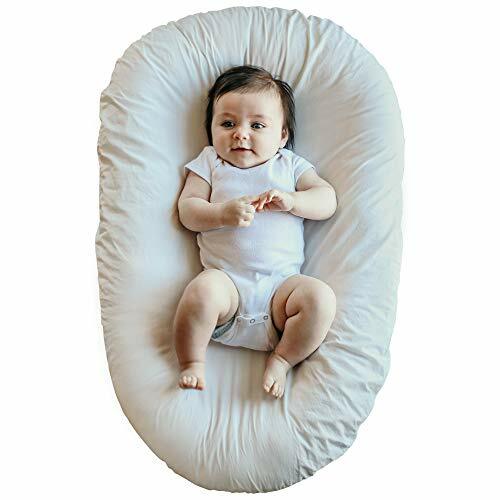 The cover is made of GOTS-certified fabrics, and it’s filled with virgin polyester filling to help your baby stay warm and snug. When needed, you can remove the cover to clean it. It’s also available in five earthy colors — moss is a personal favorite. The snug fit is great for babies who prefer to be held. Can be used as a lounger and for tummy time. A few parents said the cover doesn’t fit as tightly as they would like. Those first few months are often a blur of crying, feeding, and changing. Lots of things are happening and parents often end up sleep-deprived (please don’t remind me). Having your baby close to you can make those midnight feeding times a little easier, especially if you’re breastfeeding. Being able to have your newborn close to you is important. This co-sleeper can rotate 360 degrees, so it’s easy to get close. The base of the stand has four points to keep it stable. It also allows for the crib to be even closer to you since you can tuck the points underneath your bed. As a new mother, you want to be able to get to your baby quickly if needed. On this co-sleeper, you can lower the side wall completely, to gain quick and easy access. To keep your baby safe, it includes a fitted sheet which is 100 percent polyester. You can quickly clean it with a damp cloth in case of any minor accidents. The mattress pad is made from polyurethane and is chemical-free, and it’s also JPMA-certified. The bassinet is quite heavy at 28 pounds, so it’s best to keep it in one place. Don’t plan to use it in the living room for naps. Rotates and swivels 360 degrees. Side can be lowered for easy access. Soothing center with nightlight, lullabies and sounds, and auto shut-off. The swivel feature should have a locking facility. Its weight makes it less portable than it could be. Twins are a double blessing, but they also need double of everything — that includes space. Keeping your love bugs close to you at night can make the late night feedings a little easier. With twins, you have the choice of either getting two of the same product or one that accommodates both. The expenses of raising twins can be hard on any parent. It might be a good idea to invest in something that can be used in more than one way. Take this pack n’ play. It has two bassinets where your precious bundles can sleep. Then, during the day when the twins are awake, you can remove the bassinets to use the playard. The mattress pads are quilted, so they’re comfortable for your babies. Each bassinet has a mesh canopy to shield the babies from bright lights. As the twins grow, you can use the playard for daytime fun and safety. The translucent mesh also enables you to keep a watchful eye, even from afar. The whole playard is rather big. But you can place it close to your bed so you can be ready when the babies wake. It also has two wheels, so it’s easy to move around. Mattresses are comfortable but, most importantly, safe. Some parents said it was difficult to assemble. Toddlers can be a world of troubles. There are tantrums, pickiness, and unfortunately, the sleepless nights may continue. Many toddlers just aren’t ready to sleep away from mommy and daddy — and that’s fine. Toddlers do need more space to sleep in, though, since they most likely will be tossing and turning. Having a co-sleeper that will grow with your baby can save you time and money. This co-sleeper works for infants as well as toddlers. As long as your child’s shoulders and hips fit in the center of the sleeper, it’s suitable. The design itself is a bit like the Snuggle Me. It will hug your child as they sleep in it, making them feel as if they’re in your arms. The center is slightly padded, so you don’t have to worry too much about the surface being uncomfortable. The raised edges help prevent your child from rolling over as they sleep. The co-sleeper is lightweight, but it’s on the larger side and quite difficult to bring along when traveling. Nevertheless, a happy toddler needs their sleep, and this sleeper creates a safe environment for them to get the necessary snoozing-time. Creates a comfy sleeping area. Padded bottom makes it comfortable on all surfaces. Some moms mentioned that it was difficult to fit into luggage for traveling. Breastfed babies usually wake up more often than formula fed babies. That means mommy has to be prepared to get up several times a night. But having to navigate your way to the baby when you’re still half asleep can be quite a challenge. For mothers who like to keep a close eye on their baby during the night, this co-sleeper could be a great option. You can place it in your bed for safe bed-sharing. It gives your baby their own space to sleep in, while you are close by. It has a little nightlight to help you navigate during those midnight feedings. For breastfeeding mommas, it’s a lifesaver to have your baby within arm’s reach. You can quickly remove the fitted sheet and overall cover and throw it in the washer. It’s made out of a cotton and polyester blend to keep your little one snug as a bug. Unfolded, the sleeper is 28 inches long and 16.5 inches wide. You can also fold it, which makes it easy to store or travel with. 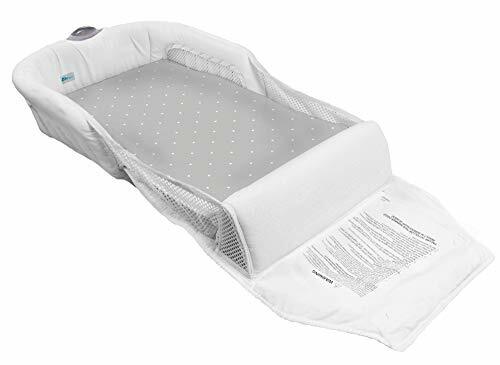 However, this sleeper seems to suit younger babies better than older ones, since it doesn’t provide much support for rollovers. Sheet and cover can be machine washed. Babies will outgrow it quickly. Not enough support for older babies who roll over. Traveling with a baby can be stressful, especially when it comes to sleeping arrangements. When you’re away from home it can be a bit of a challenge to figure out where the baby should sleep. Often, some babies will have a hard time sleeping in an unfamiliar bed. Helping your baby get a good night’s rest while traveling is essential. This co-sleeper will give your baby a comfy, safe, and familiar sleeping area, no matter where you go. The sleeper is foldable, and you can even get a travel bag to make it more convenient. The cover of the sleeper is made out of 100 percent cotton, so it’s gentle on your baby’s sensitive skin. It’s made of OEKO-TEX certified fabrics, which help your baby maintain a healthy temperature while sleeping. Tummy time is crucial for small babes. The rounded sides on the sleeper work well to prop your baby up when on their belly. 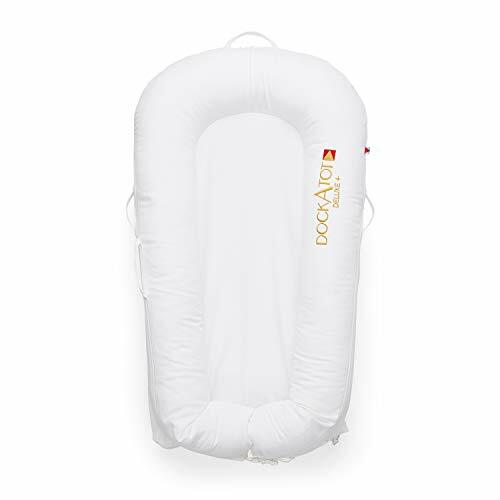 You can also use the co-sleeper as a baby lounger during the day, or maybe even bring it to the beach. Creates a safe and familiar sleep environment. Can be used for other activities. Easy to take with you. Some parents reported having trouble keeping the buckles closed. Can be complicated to put back together after washing. What are the Best Travel Cribs on the Market? Having a baby can take a toll on your bank account. When preparing for the new addition, we often forget all about our budget — especially when everything looks so cute. When shopping on a budget, we want something that’s good quality but still affordable. If you want quality on a budget, this sleeper could be it. It has a sturdy metal frame that protects your baby. The whole bed can be folded for easy storage or traveling. A feature you’ll love is the sides which are lined with mesh fabric, which allows your baby to get good air circulation. They’ll also make it easy for you to check on the baby. There are two compressible sides on the sleeper, which makes it even easier for you to reach your little one when needed. The sleeper is made out of polyester and is chemical-free, with no flame-retardants. Having something that your baby can grow with is also important if you’re on a budget. This is a full 32 inches long, so there’s plenty of room for growth. That said, it’s also due to the size that many moms claim it’s too big to have in the bed with them. Prevents parents from accidentally rolling onto the baby. Mesh sides are breathable and cool. Large size for growing babies. Some parents said the large size took up too much space in a queen-size bed. A good co-sleeper creates a safe sleeping space for your baby, while still keeping them close to you. It’s always important to check the mattress pad: it should be thin and firm. As a proud co-sleeper myself, a favorite product of mine is the Snuggle Me Organic. 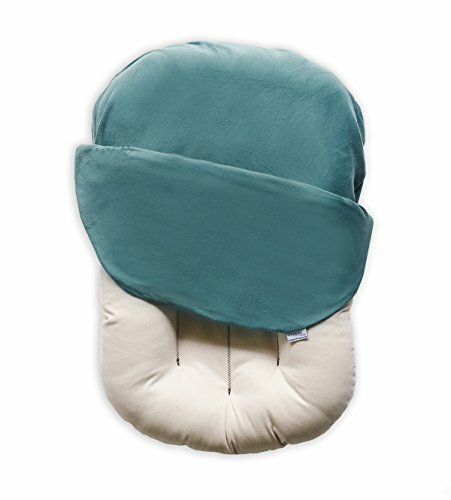 It looks so comfy, and as a mom of a light sleeper, I would definitely have used this when my baby was small. Are you planning on co-sleeping? Do you prefer room-sharing or are you a bed-sharer? Leave a comment below, tell us what you think, and share with your mommy friends. What are the Best Baby Swings for Calming Your Baby?